A turbocharged car likes a large free flowing exhaust. The freer it is, the more it flows. The more it flows, the more power you make. Cobb Tuning has made these 3" stainless steel downpipes available for the Nissan GT-R at $995. They say that installing the downpipes will improve spool by 200-300 rpms. Installing the downpipes is a pretty big job, but worth it once you hear the sound, and the improvement in response and power you get. Take your Stage2 GT-R with upgraded Y-Pipes to the next level with the COBB Tuning 3” Catless Downpipe Kit. Consistently improve turbo spool-up by 250-300RPM and open the door to maximum stock turbo power output when coupled with complementary modi cations including; injectors, fuel pumps, intakes, boost tubes and intercoolers. 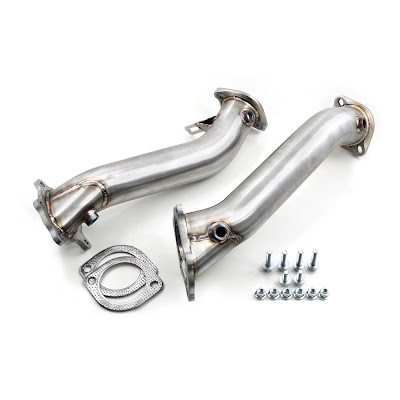 These high- ow, mandrel-bent, 304-stainless downpipes remove the restrictive stock catalytic converters for better ow, faster turbo-spool and improved transient response. This downpipe kit is a direct OEM replacement and will bolt up to the stock exhausts system or aftermarket systems alike.